Proteins are susceptible to spontaneous chemical degradation that can occur on timescales ranging from hours to decades, which may explain why the half-lives for many proteins are measured in days. At the same time, protein recycling is energetically inefficient and, in many cases, implausible. This makes the existence of long-lived proteins (LLPs) inevitable. Indeed, LLPs have been detected in tissue from the brain, eyes, skin, teeth, muscle, and heart, with residence times ranging from months to entire lifetimes. Many LLPs are associated with diseases (e.g. cataracts, Alzheimer’s disease, and Parkinson’s disease) where protein homeostasis, or proteostasis, is disrupted. Proteostasis is crucial for maintaining cell viability and involves processes that include protein synthesis, folding, and recycling, among others. 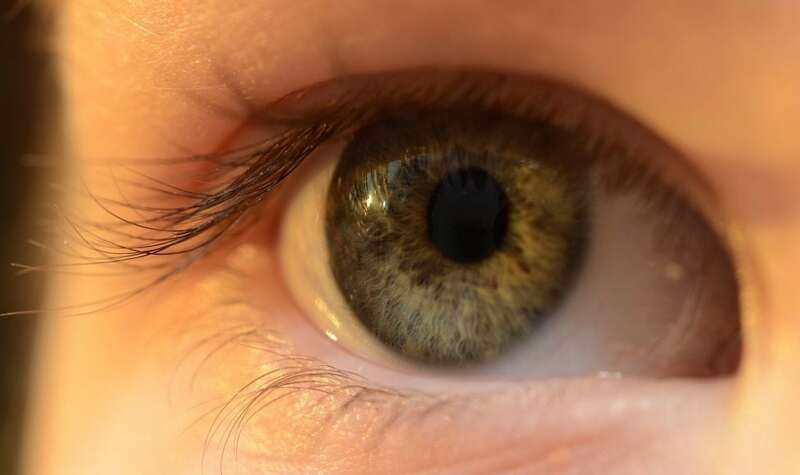 Some of the oldest proteins in our bodies can be found in the lenses of our eyes. During the final stages of maturation, lens cell organelles are dismantled, removing the machinery normally responsible for digesting and rebuilding proteins. The lack of protein turnover has made the lens an ideal target for studying LLP degradation. The accumulation of unwanted post-translational modifications (PTMs) is one way these proteins are degraded, as they induce perturbations in the protein structure which can then lead to loss of functionality. A class of subtle, yet highly problematic, PTMs have recently gained the attention of the Julian lab. This modification, known as isomerization, is the most prevalent modification in aged human lenses, but identifying it remains an analytical challenge. Isomerization is invisible to most detection techniques, and this shortcoming contributes to the lack of scientific data about it. Aspartic acid is most susceptible to isomerization among the canonical amino acids, and asparagine can produce the same products via deamidation. 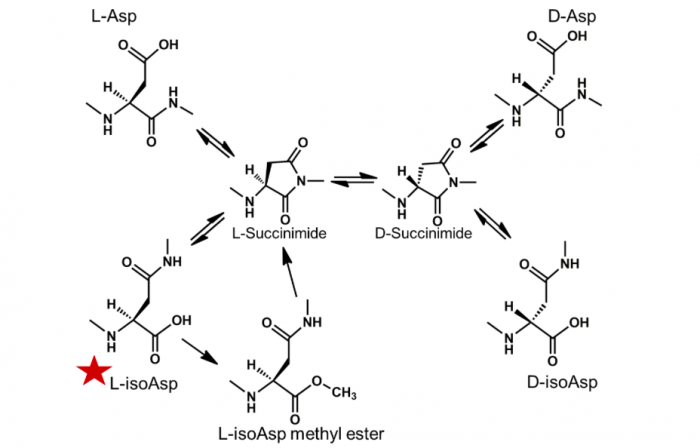 Over time, sequences containing L-Asp will spontaneously undergo conversion into a succinimide intermediate that can be hydrolyzed to form four isomeric products: L-Asp, L-isoAsp, D-Asp, and D-isoAsp (Fig. 1). Upon closer examination of this data, we see less isomerization in the younger cortical lens fractions and also changes in the isomer distributions. In many Asp-containing peptides from the crystallins, it was found that the levels of L-isoAsp were significantly higher in the nucleus than in the cortex. On average, the relative amount of L-isoAsp increases from 7% in the cortex to 18% in the nucleus, with no other Asp isomer producing such a notable increase between the two regions. Protein L-isoaspartyl methyltransferase (PIMT) is the only known repair enzyme for age-related Asp isomerization. Extensive work by Steven Clarke and coworkers revealed that PIMT is an S-adenosyl-L-methionine (SAM)- dependent enzyme that methylates L-isoAsp residues and D-Asp (700-10,000-fold lower affinity), allowing partial reformation of the L-Asp form. Additionally, they found PIMT activity decreased with increasing age, including a reduction in activity in the nucleus compared to the cortex. We have confirmed that PIMT is present in the lens, but the differential isomerization we observe suggests that PIMT has lost activity in the nucleus. Most of the protein in the nucleus of the eye is insoluble, but the increase of L-isoAsp in the nucleus reveals that isomerization continues to take place. We have previously noted in studies of animal lenses that Asp repeats are particularly prone to isomerization. There are at least two potential explanations for this observation. One, the initial isomerization increases flexibility, facilitating additional isomerization. Alternatively, the second explanation rests on the observation that PIMT cannot repair residues that are N-terminal to acidic residues. Therefore, only the C-terminal Asp in sequential acidic residues could be repaired. The human lens offers a unique chance to distinguish between the two possibilities. The peptides 88VQDDFVEIHGK98 (from αA crystallin) and 93VLGDVIEVHGK103 (from αB crystallin) both contain Asp residues in similarly structured proteins with C-terminal acidic residues, yet only 88VQDDFVEIHGK98 undergoes extensive isomerization. This suggests that PIMT repair is a less important factor, at least in the case of this protein. These experiments have focused on the unique protein environment within the eye lens and have revealed some of the inner workings of LLP degradation and repair, but is not safe to assume that the results do not apply outside the lens. 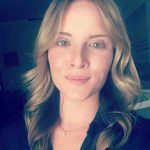 Indeed, LLPs are found throughout the body and are implicated in many diseases associated with aging, including Parkinson’s disease and Alzheimer’s disease. Examination of other long-lived proteins associated with age-related diseases reveals the presence of numerous acidic acid repeat sites that would be similarly susceptible to isomerization. The lessons learned in the lens may well apply to these systems. These findings are described in the article entitled Differences in α-Crystallin isomerization reveal the activity of protein isoaspartyl methyltransferase (PIMT) in the nucleus and cortex of human lenses, recently published in the journal Experimental Eye Research. This work was conducted by Yana A. Lyon, Georgette M. Sabbah, and Ryan R. Julian from the University of California, Riverside. Dr. Ryan Julian is a professor of chemistry at the University of California Riverside. He received his B.S from University of Utah in1999 and his Ph.D. from California Institute of Technology in 2003. His areas of expertise are Analytical Chemistry, Chemical Biology, Computational Chemistry, and Physical Chemistry. His current work focuses on the development of novel applications of mass spectrometry to investigate the chemistry and biology of proteins and related biomolecules.